*Between August 12, 2016 and January 2, 2017, a concurrency period allowed building permits and other required documents to show compliance using either the energy provisions in effect prior to August 12, 2016, or the amended energy provisions effective August 12, 2016, but not a combination of the two. As of January 12, 2017, 189 municipalities comprising 65.8% of the state’s population have adopted the stretch code. Previously based on the 2009 IECC and ASHRAE 90.1-2007, the revised stretch code now references the 2015 IECC and ASHRAE 90.1-2013. Municipalities that have adopted the stretch energy code shall use the energy efficiency requirements of 780 CMR 115.00: Appendix AA (Stretch Energy Code). These requirements replace all previous stretch energy code requirements. Code amendment cycles occur twice a year, as required by statute, and include a public hearing process. The Board of Building Regulations and Standards has sole authority to promulgate the Massachusetts State Building Code (MSBC). Anyone can submit code change proposals to the Board. Adopted code changes are typically promulgated during the year of adoption. The state Board of Building Regulations and Standards (BBRS) is required to revise the building code to the latest version of the IECC every three years. Public hearings are held each May and November to consider proposed modifications to the code. At the beginning of 2016, the Massachusetts Board of Buildings Regulations and Standards (BBRS) completed a final draft of the ninth edition of the MA State Building Code, based on the suite of 2015 I-codes, including the 2015 IECC. Details about the review and public hearing processes that will take place in 2016 can be found here. The Board of Building Regulations and Standards (BBRS) approves a final draft of the 9th Edition of the MA State Building Code (780 CMR). The proposed new code includes the 2015 IECC with state amendments. The draft regulations will now be reviewed by the Executive Office of Administration and Finance to determine if the regulations comply with Executive Order 562 and then proceed to a public comment period. The 2012 IECC and ASHRAE 90.1-2010 become the effective statewide energy codes following an extended concurrency period. This is the eighth edition of the MA State Building Code. BCAP submits public comments in support of proposals to update the Massachusetts state building energy code to the 2012 IECC. The Boston City Council approves the adoption of the Massachusetts ‘Stretch’ Energy Code, an enhanced version of the 2009 IECC with greater emphasis on performance testing and prescriptive requirements. It was designed to be approximately 20 percent more efficient than the state’s current baseline energy code, the 2009 IECC. The code gives design and building professionals multiple options for reducing energy use through increased insulation, more efficient HVAC systems, and other measures. The code will take effect in July 2011, making Boston the 59th community in the state to approve the more stringent regulations. Adoption of the broader set of the 2009 suite of I-codes is amended into the eighth edition of the state building code, maintaining the 2009 IECC/ASHRAE 90.1-2007 and now including the residential portion of the 2009 IECC, which will become effective on February 4, 2011. 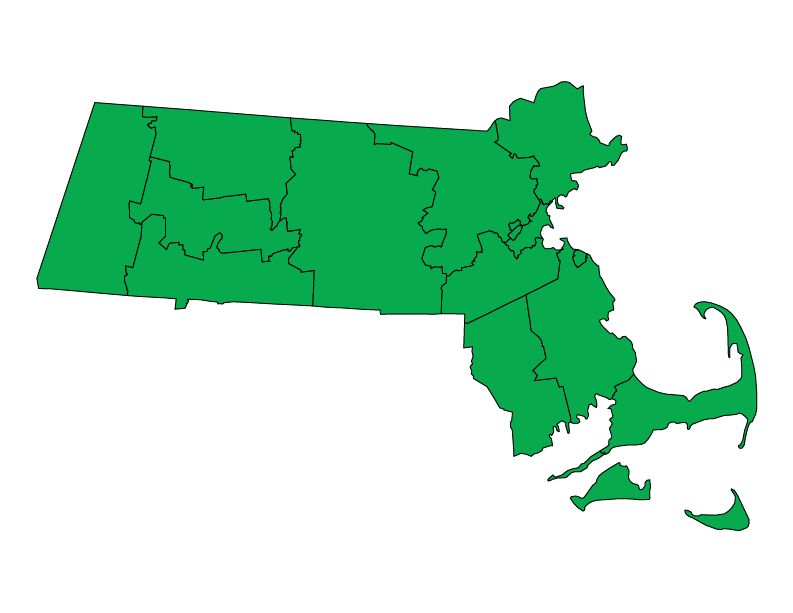 Following a six-month concurrency period, the baseline energy conservation requirements of the state building code default to the 2009 IECC with Massachusetts amendments. A number of amendments are made to the eighth edition base code following its implementation. Massachusetts’s Governor Deval Patrick designates 35 cities and towns as the Commonwealth’s first official “Green Communities” – a status that makes them eligible for $8.1 million in grants for local renewable power and energy efficiency projects. The projects promise to create green jobs and advance both municipal and state clean energy goals. “We are confident that these 35 municipalities – and the projects they will undertake with Green Communities grants – will serve as shining examples to the Commonwealth’s other 316 cities and towns, all of which we hope will also work toward becoming Green Communities and reaching their clean energy goals in the months ahead,” said DOER Commissioner Phil Giudice. In accordance with the statutory requirements of the Green Communities Act of 2008, the Board of Building Regulations and Standards (BBRS) amends the 7th Edition State Building Code (780 CMR). As of January 1, builders must use the 2009 IECC with MA amendments. BBRS allows a six-month concurrency period, through the end of June 2010, during which either the previous code (the 2006 IECC with the 2007 IECC Supplement and MA amendments) or the new code may be used. Massachusetts Governor Deval Patrick sets two major goals for energy efficiency and renewable energy. The first aims to make all new malls and “big box” retail stores energy efficient and powered in part by solar energy by 2010. The second goal is for the state to offer a super-efficient building code as a local option for municipalities based on established national voluntary above-code efficiency standards such as the ENERGY STAR for Homes program and the New Buildings Institute’s Core Performance program for commercial properties. Governor Deval Patrick signs the Green Communities Act (GCA) into law. Policies set in motion by this act include building efficiency standards. Towns that are Green Communities are required to adopt the stretch code. The Seventh Edition of the Code for Single and Two Family Dwellings becomes effective. A six month overlap period until October 1, 2007 allows a code user to use either the sixth or seventh edition of the code (without mixing provisions). A permit applicant would have to file an application on or before October 1st in order to utilize provisions of the sixth edition. Then-Governor Romney creates the Office for Commonweath Development (OCD), which was charged with creating the first Massachusetts climate action plan. Completed the following year, the Massachusetts Climate Protection Plan aims to reduce greenhouse gas emissions and improve energy efficiency in the state. The U.S. Environmental Protection Agency (EPA) awards OCD with the National Award for Smart Growth Achievement for Overall Excellence in Smart Growth. By statute, the uniform MSBC becomes the single, legal statewide building code, applying to all new construction and certain work in existing buildings. The energy provisions of the MSBC were developed by the Board’s Energy Advisory Committee, working with staff supported by a federal grant from the U.S. Department of Energy and with additional support from the Massachusetts Division of Energy Resources (DOER), which administers utility rebate programs and establishes state energy policy.